Precious metals sharply gained throughout yesterday's trading session, where we witnessed gold recording a new high above $1153.00 per ounce before slightly dropping, but still closing with gains by 0.25% at 1143.40 in New York yesterday. Dollar has continued to hold near 75 levels after drop to15-month low earlier in the week.Choppiness in equity markets may keep a check on the downside. MCX Gold may trade in a range of Rs.16850 to Rs.17200. On intra day basis spot gold price have immediate support at $1127/$1118 where as resistance is seen at $1153 / $1158. Slver sharply rose as well achieving its highest price at $18.86 per ounce before returning to slightly fall and close lower at 18.56 gaining 0.76%; Rally in Gold to record high levels and in Copper to 14-month high has led to a sharp jump in Silver which acts both as an industrial metal and a precious metal.MCX Silver may trade in a range of Rs.27550 to Rs.28700. Spot silver shall finds support at $18.15 /$17.85 where as resistance is seen at $18.75 /$19.15. Today, oil prices are losing their strength as there are worries about the strength of the global economic recovery; therefore confusion back in markets which weighed on oil prices as investors walked out of oil markets. The markets today opened at $79.63 while recording a high of $79.87 and a low of $79.00 per barrel. MCX Crude may trade in a range of Rs.3615 to Rs.3750.Nymex Dec contract will move in the range of $75.50 to $80.20 . Copper may remain firm amid rallying gold prices, weakness in U.S. dollar and supply concerns at Chile’s Spence copper mine. However weaker U.S. economic data and rising inventories on LME continue to indicate weaker demand. This may keep a check on the upside. Also weighing on prices is choppiness in equity markets. 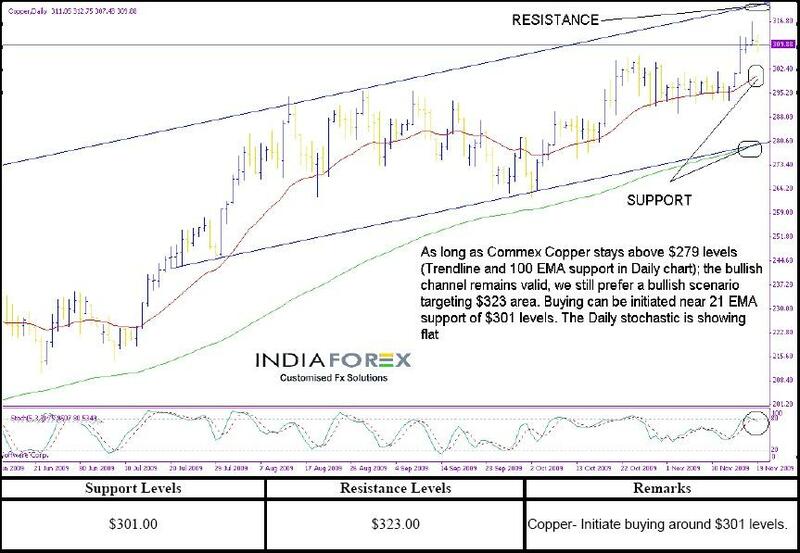 MCX Copper may move in a range of Rs.313 to Rs.322. Copper crucial support seen at $307 levels whereas resistance is seen at $315 levels. Soya product futures ended mixed, with soyoil consolidating after rising to a new fivemonth high in early trade. Weakness in the U.S. dollar and borrowed strength from crude oil futures underpinned soyaoil initially, but once crude oil reversed direction, futures quickly retraced the early gains, analysts say. Solid underlying demand is supportive, but without outside support, futures struggled to maintain upside momentum, analysts add. Soyameal futures ended mixed, with nearby contracts finishing higher on strong near-term demand and firming cash basis levels. A minor correction in the meal/oil spread relationship underpinned meal as well. December soymeal ended $1.80 higher at $310.50 per short ton, and December soyaoil finished 6 points lower at 39.05 cents per pound.